The School of Veterinary Medicine and Biomedical Sciences is located in Veterinary Medicine and Biomedical Sciences Hall (VBS) on the University of Nebraska–Lincoln's East Campus. Please use Google Maps to obtain driving directions from other locations. Click the image to view a larger map. 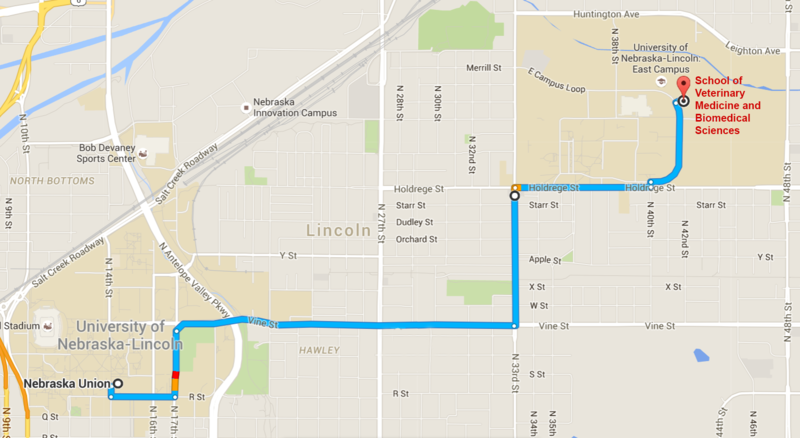 Downloadable maps of the university's City Campus and East Campus are available at maps.unl.edu. Please scroll down and click on the "Download Map" icon.